St. Soter was pope long ago in the times of the Roman emperors. He was a real father to all Christians. He gave much help to those who were poor. He took special care of those who had been condemned to work in dangerous mines. They were sent there because they would not give up their faith in Jesus. These brave Christians were hungry all the time. They were allowed only a little rest. Other Christians were chained up in prisons. Good Pope Soter did everything he possibly could to comfort and help them. 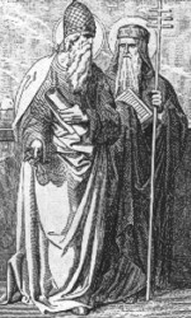 St. Soter also helped Christians who were far away from Rome. This holy pope was a great preacher. All the Christians loved to listen to him explain our religion. He spoke with such love. He inspired them with the courage to die for Jesus rather than sacrifice to false gods. St. Soter himself gave his life for Jesus in the year 174 after having been pope for ten years. St. Caius was pope about one hundred years later. He, too, lived in times of persecution. This pope did all he could to prepare people to keep the faith at any sacrifice. To be of more help to his people, he lived eight years in underground rooms, called catacombs. These were cemeteries where the Christians often met in secret to pray and receive the sacraments. This was their hiding place from the cruel pagan soldiers. The Christians knew they would be killed if they were caught. St. Caius was pope for twelve years. Then he, too, was martyred. He died in the year 296. Today people in different parts of the world are still persecuted because they are good Christians. Let us offer our prayers and sacrifices that Jesus may comfort them and give them courage. from Saint of the Day Lives, Lessons and Feast, By Leonard Foley, O.F.M. ; revised by Pat McCloskey, O.F.M.